I originally played Night Shift on my Commodore 128D in the C-64 mode. 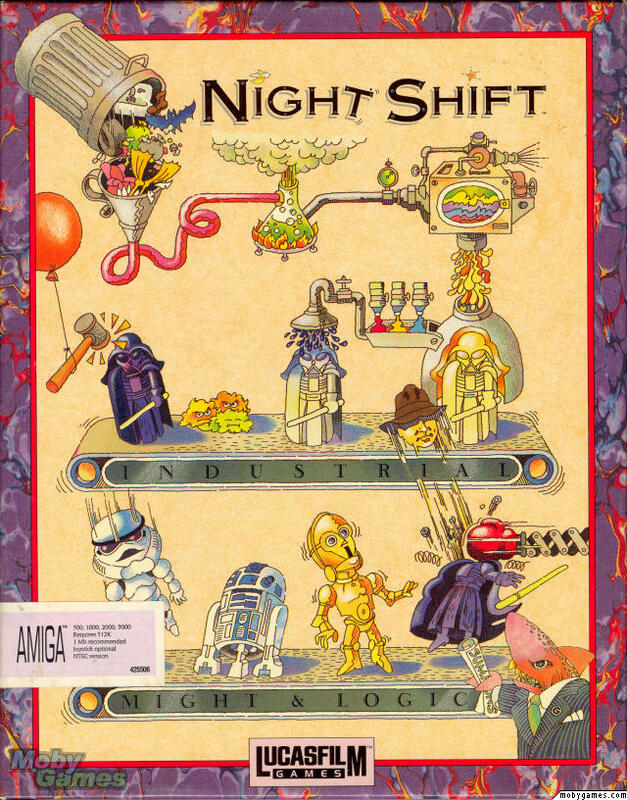 This was the third LucasArts game I owned for my C-128D, but unlike Maniac Mansion or Zak McKracken, Night Shift is a leveled-up, platforming video game with an arcade-style design. I thought NS would be an interesting change from the LucasArts graphic adventure games like Maniac Mansion and Zak McKracken I’d been playing before on the C-128. Not to mention, I love platforming games like Super Mario Brothers or Metroid, how could I go wrong? What I got was some thing different, very different! I’ve played the game in 1990 when I got it for the computer and I do remember getting quite a way through the game on the C-128, but I remember there was a point I just hit the wall and couldn’t make it any further. I’ve recently started playing the game on DOSBox, and yeah, I’m having trouble getting pass the first few levels! This game is tough. 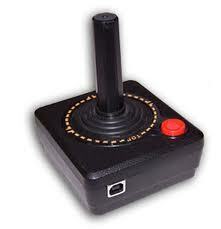 And while the joystick I have for it really isn’t all that great for playing a game like this too. I just don’t remember it being that tough on the C-128, but the system was different, the game was different, and I had a joystick from the same time period, which might be contributing to my frustration. Not to mention, if you look at this C-64 version and compare it with the DOS version from the same period, WOW, what a difference i the graphics, colors, etc. I’m actually blown away by the difference in the gaming. But I remember the C-64 version getting “slowed” down in spots which made it easier to react to the situation around you. I don’t think the slow down was intentional, but it didn’t hurt. Did I love this game? I think “loved” might be a strong word for the game. It was a certainly a huge departure in the computer gaming I’d been doing up to this point in my life, but it reminded me a lot of the arcade-style games I was playing at the Huckleberry Junction about the same time. So this wasn’t one of my all time favorite games from LucasArts, but I do have a place in my RetroBearGaming site for Night Shift. You play the game as Fred or Fiona Fixit who is running the maintenance on this giant machine which manufactures little Star Wars and other LucasArt property action figures. The machine is affectionally called “Beast” because it’s constantly being a problem breaking and generally causing issues for the person running it. You’re given a quota at the beginning of each shift for a specific number of figures in different configurations and colors. The machine is constantly breaking, hence the name of the machine: “Beast”!!! Fixit has to fix broken parts of the machine, configure it differently, keep lemmings from causing issues with the machine, and other things, like generating power. Oddly, in all this happenings, Fixit can’t die! Maybe by accidentally falling into the machine and being ground in to a million pieces. You always survive and basically either win or fail the level by how you do against the quota for figures on each shift. One of the best parts of the game is watching the piraña plants, which you can use as traps to capture and kill lemmings which are causing issues on the machine. You can place the plant down and if the lemming gets to close to the plant, the plant captures the lemming and “eats” them with this cute chewing action. LOL.. awesome! Personally, if this company has this many problems with the machine, because they stopped performing regular maintenance, I would expect some Fred or Fiona Fixit to die in the jaws of his unforgiving “Beast”! The game was cute, because it was the first time I remember in a LucasArts games (LucasFilms at the time) that they opening embraced the company’s Star Wars and Indiana Jones roots in a video game. You to get to create little Stormtroopers, Darth Vadar, Indiana Jones and C3POs. The game manual was something really fun as I remember, although I don’t have a copy of it any longer. The game manual was designed as a handbook for the company (Industrial Might and Logic, a joke on Industrial Light and Magic, a LucasArts company) and included handwritten notes, coffee stains and general disarray on the manual. It was actually quite and impressive book considering it was a video game. I really loved this game on my Atari ST and played it alot, although in later levels I had to use a cheat to further advance in the game. Initially I had seen the game on a friend’s Amiga and immediately got hooked.